Who am I? 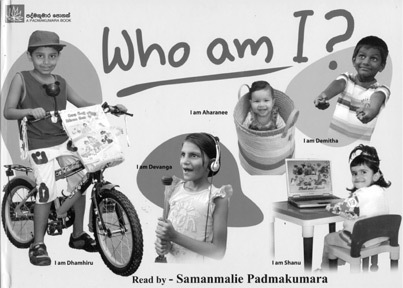 is a book specially meant for children written by Samanmalie Padmakumara. It is all about a child's dream about the future. This book gives them an opportunity to imagine what would they be when they grow up. The very first question that a teacher asks a child when he enters school is “What would you like to be in the future?” Hence the child starts to imagine and create a world of their own. The author gives children the opportunity to enter the world of their imagination. Children are encouraged to think about themselves and their future. The book is illustrated in a beautiful manner which attracts the children. Children will be interested in reading the pages as they are eye-catching. The book is an ideal gift to children to create a world of their own. “The world Samanmalie creates for children is joyous and refreshing. Her stories are unadorned and paired to the basic elements speaking directly to the hearts of the children,” said Sumitra Peries. “I am so pleased to read and look at the text and the pictures of the book which had given a tremendous joy to all our children and teachers. This is a result of a great commitment of the writer Samanmali Padmakumara who had proved how to to be a success in writing for children,” said Jayanath Colombage, Navy Commander of Sri Lanka. Reema Colambage, the President of SLNS commenting on the book said, “Pictures were mainly done by photographs and it is a new system. It is surely a better way of the text much effectively. By thinking like a child and talking like a child, the author captures the innocence which is the very essence of childhood. To be a great artiste one has to think like a child, see like a child not for a day, not for a year but for a whole life-time, said Akira Kurasawa, the great Japanese film director.